Overstock item. Only left. Includes shipping to contiguous U.S. 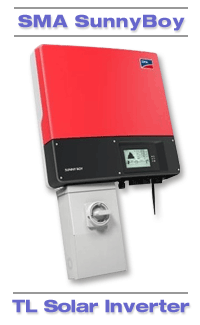 The Sunny Boy 3000TL-US represents the next step in performance for UL certified inverters. Its transformerless design means high efficiency and reduced weight. Maximum power production is derived from wide input voltage and operating temperature ranges. Multiple MPP trackers and OptiTrac™ Global Peak mitigate the effect of shade and allow for installation at challenging sites. The unique Secure Power Supply feature provides daytime power in the event of a grid outage. High performance, flexible design and innovative features make the Sunny Boy TL-US series the first choice among solar professionals.